The CET has been involved in the design, protocol development and running of a number of high-profile transplant trials, including a pivotal role in the ongoing COPE project. Through our partnership with ESOT, we also offer free help and advice to members in the design of their upcoming trials. The Consortium for Organ Preservation in Europe (COPE) is funded through the EU's 7th Framework Programme on research, technological development and demonstration and is the official organ preservation task force of the European Society for Organ Transplantation (ESOT). The Consortium brings together academic institutions, clinical and scientific experts and small and medium sized enterprises from across Europe to work together on advancing organ preservation techniques. Central to the COPE project are three large, multicentre, clinical trials investigating novel preservation devices for kidney and liver transplantation. The Centre for Evidence in Transplantation, as a partner in COPE, has been involved in the design and running of these trials through the WP8 methdology work package. The three trials are described in more detail below. 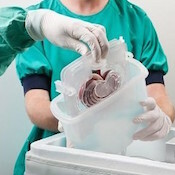 This is a randomised controlled trial comparing the current standard method for preserving a liver (in an ice box; SCS) with a new technique called normothermic machine perfusion (NMP). This technology has been developed by Prof Peter Friend and Prof Constantin Coussios at Oxford University and the device is produced by OrganOx Ltd. The technique involves perfusing a liver with oxygenated blood, nutrients and medications at normal body temperature to preserve the organ in a functioning, physiological state. A total of 220 livers will be randomised to SCS or NMP in seven transplant centres in the UK, Spain, Germany and Belgium. 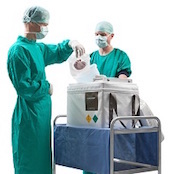 If randomised to SCS the liver will be stored in an ice box and the retrieval and transplant will proceed in the conventional manner. 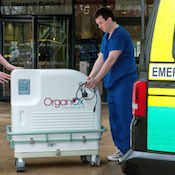 If the organ is randomised to NMP then it will be placed on the OrganOx machine from the time of retrieval, throughout its storage and transport, until it is eventually transplanted. The primary outcome measure for the trial is the peak transaminase level (AST) within seven days post-transplant. Many secondary outcomes are being recorded including graft survival and function, MRCP evidence of iscaemic cholangiopathy and a health economic analysis. Recruitment completed in early 2016, and the primary endpoint analysis has been completed. A manuscript is being prepared for publication later this year. The objective of this randomised controlled trial is to evaluate pre-implantation reconditioning of donor kidneys from extended criteria donors (ECD) using oxygenated machine perfusion following cold storage. This study is led by Professor Andreas Paul from the University Clinic Essen in Germany and includes transplant centres in Germany, the UK, Belgium and The Netherlands. The trial device is provided by Organ Assist Products B.V. and the Centre for Evidence in Transplantation has supported trial design and protocol development. Once ECD donors are identified and randomisation is undertaken, both donor organs are placed in cold storage. However one will then be placed in the trial device - Kidney Assist - and will receive hypothermic oxygenated machine perfusion for a minimum of two hours prior to transplantation. The primary outcome measure in this project is death censored graft survival at one year, with secondary measures of delayed graft function in the first post operative week, graft function: primary non function periodically, and graft and patient survival at three months and one year. We are also recording the length of hospitalisation, and take biopsies for histology pre and post perfusion, plus biopsies of proven rejections. This randomised controlled trial is designed to question whether oxygenated machine perfusion is superior to non-oxygenated machine perfusion in increasing the longevity and quality of older cardiac death donors (DCD) kidneys for transplant. The trial is led by Professor Jacques Pirenne and his team at the University Hospitals Leuven (BE) and includes transplant centres in The Netherlands and the UK. The trial device is provided by Organ Assist Products B.V. and support has been given by the Centre for Evidence in Transplantation in designing the study and writing the trial protocol. The protocol sees kidneys at donor centres immediately after procurement being randomised to hypothermic machine perfusion, one with oxygen, and one without. The organs are then transplanted into a recipient adult in end-stage renal failure on the active waiting list for a kidney only transplant. The primary outcome measure for this trial is long-term graft survival and secondary measures include primary non function, serum creanine at one, three and 12 months, functional DGF, graft and patient survival. The Centre for Evidence in Transplantation and the European Society for Organ Transplantation (ESOT) have initiated a collaboration and have agreed that the CET will become the Knowledge Centre for ESOT with a special emphasis on helping with the design and reporting of randomised controlled trials in Europe. As well as the assistance with literature search and trial design outlined below, the collaboration has also led to the Evidence in Transplantation (EVIT) course and the monthly Transplant Trial Watch. The aim of the collaboration is several fold but one major project is to improve the methodological quality of European transplantation trials by advising investigators in the early stages of trial design and planning. An analysis of all randomized controlled trials (RCTs) in organ transplantation between 2004 and 2006 has shown that only around one third of trials were of good methodological quality. This detracts from the value of the evidence provided by these poor RCTs. This free service is available to ESOT members or any residents of Europe. To receive help with the design of a randomized controlled trial, contact us. Please refer to the SPIRIT statement for designing a trial protocol before submitting your protocol. A checklist is available which should be submitted with your protocol. Once the protocol is approved it will receive ESOT-CET accreditation and will be added to the ESOT-CET trial registry that is being developed.